Shakara/London Scene are two classic albums from 1971, and 1972, that feature complex James Brown-influenced grooves, unison horn riffs, jazzy sax solos, and polyrhythmic percussion work. Listeners are instantly treated to funky 70s-grooves that last between five and thirteen minutes in length. These grooves tend to feature melodies on guitar, tenor guitar, bass, and horns that are all counterpoint. Fela traditionally enters the groove by adding dissonant, yet jazzy, electric piano chords. He likes to slowly introduce themes on keyboard and build momentum. The unison horn-section usually comes in with a jazzy counter-melody or song theme. At other times they introduce brand new themes after a composition's mid-point. The horn-riffs remind me of some of Frank Zappa's work due to their eccentric sound. But they are most likely influenced by James Brown, Miles Davis, and Charles Mingus among others. Fela does quite alot of sax soloing as well. His sax-style is rather advanced, and influenced by 50s American be-bop. Avant-jazz influences do appear here and there, but they are mostly kept at a minimum in favor of a more traditional approach. Shakara starts off with one of Fela's best known song. "Lady" is absolutely stunning from beginning to end. 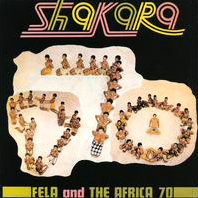 The sound here, as on "Shakara", mixes the James Brown-sound with strong African folk influences. Both compositions start with a long 5-minute instrumental section before Fela begins a catchy verse in broken-English, and Yoruba. The chorus sections on both tracks feature traditional African "call-and-response" between Fela and about a dozen of his wives. Lyrics at this point in time poked fun at a modernizing African society. But Fela would soon start to focus on increasing problems with the Nigerian government, criticize European and American imperialism, and make fun of religious fanaticism. London Scene turns the James Brown-influence up a notch and delivers five tracks that simply smoke from beginning to end. They feature fast tempos, furious horn-work(with loads of Puerto Rican and Cuban influences), and driving multi-layered percussion. These five tracks were re-makes of an apparent 1969 session in Los Angeles (which was released recently). But I heard that London Scene blows the original away. Overall, this CD is the best place to start.